But we call upon those who term themselves modernÂ humanists, and who have renounced the transcendent value of the highest realities, to give the council credit at least for one quality and to recognize our own new type of humanism: we, too, in fact, we more than any others, honour mankind; We have the cult of man. 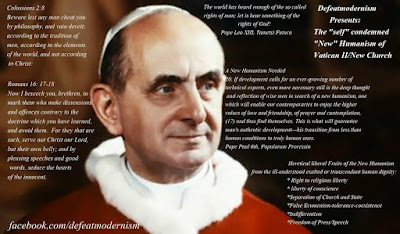 - Address of Paul VI, Council’s Last General Meeting, December 7, 1965, Italian Translation. Humanism is the philosophy of Masonry and soon the Vatican II NewChurch will surrender to "secular humanism" (Apostate; a "Church" free of dogma) and thus fulfilling Our Lady's words of :Rome will lose the Faith (Dogma of Faith as implied in the real 3rd secret of Fatima) and become the Seat of Antichrist. Fr. 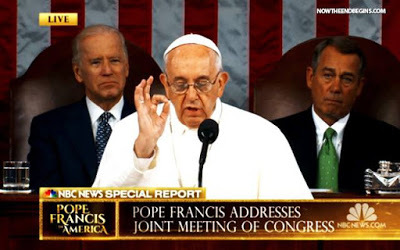 Pfeiffer explained that they checked all the internet stories out and that they were false, at this point I guess we need to watch and pray like Bishop Williamson is always saying.